Is creating chances the way to the top? Much has been made of the apparent inflated price Liverpool have paid for Jordan Henderson, believed to be in the region of £16m. 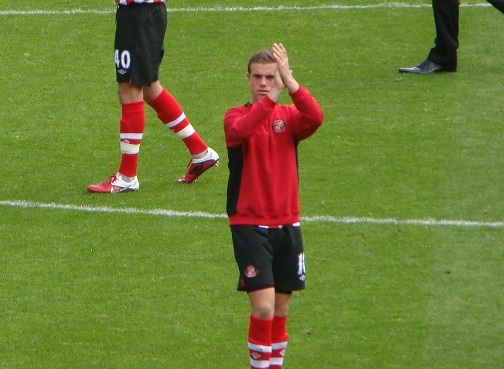 Only four players created more goalscoring chances in the 2010/11 PL season than Sunderland’s Jordan Henderson (82). The four to create more scoring chances than Henderson were Malouda (117), K Davies (91), Brunt (86) and Downing (85). Chance creation gives us a much better idea of a player’s contribution to his side than assists, for the simple reason that it’s not dependent on attacking competency. Season after season, assist charts are dominated by players from top teams, since they’ve had the likes of van Nistelrooy, Henry, Drogba and Ronaldo to ‘complete’ the assist. Chance creation – a pass that leads to a shot on goal – is hardly a perfect statistic in itself (what about dangerous crosses that finds no one? ), but it is much better than sight-based biases in player assessment. Whilst there is a downward trend in chances creation with respect to league position, there appear to be plenty of exceptions, namely Man City, West Brom, Blackpool and West Ham. Clearly, creating chances in itself is not a prerequisite for success, if relegated West Ham can tally only 8 fewer chances than champions Manchester United all season. The issue returns to attacking competency. If two teams have equally good attackers, does the team that creates more chances collect more points over the course of the season? To test this, a model with a measure for attacking ability needs to be formed. I’ve chosen to use chance conversation rates; that is total assisted goals over total chances created. This ranges from 14.5% with Manchester United to 5.8% with West Ham. Holding constant attacking ability, along with other possession and defence-based variables, chance creation has a significant effect on total points accumulated over the season. 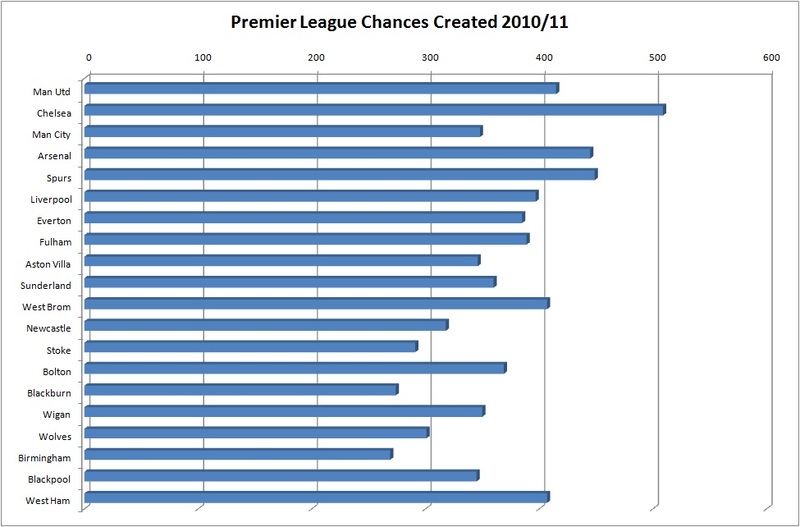 A 1% increase in chances created leads to approximately a 0.4% increase in points accumulated over the season. The brains behind Liverpool’s transfer policy, Damien Comolli, will have an even better idea of the returns on chance creation. He is of course good friends with Billy Beane, the man whose revolutionary method of valuing baseball players has now been immortalised in film after Michael Lewis’ bestselling book Moneyball. Simon Kuper’s recent FT column reveals how data drove Liverpool’s purchases of Andy Carroll and Luis Suarez; to call the article ‘fascinating’ would do it a disservice. Of course, ‘adding’ chances to Liverpool won’t yield returns unless those other variables – attacking competency and passing and defensive ability – are equal to that of their rivals. Over the course of the 2010/11 season, they fell short of the top four in all these aspects, but the numbers are skewed by Roy Hodgson’s tenure at the club. Comolli and Dalglish must believe that in Carroll and Suarez they have a partnership as clinical as any other in the division, and that the team can also hold their own in other aspects of the pitch. If not, then the additions of Jordan Henderson, and potentially Stuart Downing and Charlie Adam, may well be money foolishly spent. It may be a simple and obvious message – creating more chances for good strikers leads to a higher league position – but it’s an important element to Henderson’s game that has been forgotten in amongst debate over his transfer fee. Data courtesy of EPLIndex. Post also available on AnfieldIndex.com. Fantasitc blog mate. Keep up the good work. Love this Jordan Henderson article. Thanks 🙂 I’m sure it’s not too far away! Donna, your blog post is both beautifully stated and perfectly timed as we enter a season where so many of us have been taught that we show people how much they mean to us by how much we buy for them at holiday time.I have the same wolf-in-sheep’s-clothing thought every time I see perfectly delicious-looking strawberries out of season. Once we know better, we can do better. Comolli and Dalglish must believe that in Carroll and Suarez they have a partnership as clinical as any other in the division, and that the team can also hold their own in other aspects of the pitch. First off, nice article. Just a couple of gripes: Why would they believe that Carroll and Suarez would make a good partnership? There’s been no indication of it whatsoever. Secondly, I’m not so sure that Liverpool should be snapping up massing of midfielders when they seriously need to look at bolstering their defence, so whether they can hold their own in THAT area of the pitch is debatable. Thanks. When I say clinical, I mean in terms of chance conversion rate overall across the team, though obviously the majority of chances will fall to the strikers. I agree that they haven’t clicked in the half a dozen or so games they’ve played together, but we’ll get a better idea this season as to how efficient they are. As for defence, Liverpool kept the third most clean sheets in the division last season (behind Man City and Chelsea, level with United), and they went the back of of last season without conceding a single goal from open play in 8 consecutive games. I think most would agree more depth is required at the back, but the work of Steve Clarke paid dividends during the second half of last season.